For the last few weeks I have been putting Everloc which are a brand who are sold in over 70 countries in the world, to the test. Everloc in a nut shell are home products that require NO tools, NO drilling and NO screw-driving when installing and best yet leave NO damage on surfaces - good for those who are in rentals, DIY lovers and anyone whose up keeping a contemporary on-trend look to their home by updating regularly. A few weeks back I was sent out the large bathroom shelf to review. Only as of recently I have been getting into the home decor thing which you might have seen through my social media channels. We are about to move and I want to move into our new home with a well decked out decor so I have been testing out bits and pieces in our last few days within our home now to see what I will carry on into our new home. Let's just say right now Everloc will be coming along and be in the boxes when we pack. For us we never had a shower shelf or a shower caddy nor ever brought one, it was always the stack of hair, face and body products on the shower floor and it was quite the mess. Everloc has brought some organisation into our house and made our shower more stylish and neatly presentable. The bathroom shelf has a luxurious chrome finish and can hold up to 15kgs - perfect for those who have many products to cater to shower users just like this family. DIY things always scare me to start off with because usually it's never as easy as they make it out to be but Everloc really are easily used products that a kid could probably figure out how to do on their own as well. The Everloc bathroom shelf has suction cups on the back of the circle wall discs which you place into position and then screw/twist to set into place. Once you have set the wall discs into place then you hang the shelf itself off the hooks on the wall discs and wah la it's up. This in total took me about a minute to get together and up. 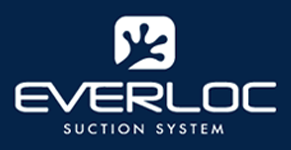 Everloc is so simple and easy to use. I haven't seen the bathroom shelf move at all nor felt any loose tension on the shelf. I am really happy with the product and highly recommend looking into the brand if you haven't already yourself. I am very keen to look more into the brand and share my findings with you. Don't let the name of the shelf 'Large Bathroom Shelf' fool you - this shelf can be used anywhere! Everloc not only look after bathroom solutions but they have products for kitchen and laundry also. Next on my list is to organiser my hair styling tools outside of the shower. Can't wait to add my collection of Everloc products.